Surimono, colour print from woodblocks with blind-embossing (karazuri) and metallic pigment, shikishiban format, circa 1830-1839. Plum and Painted Shell. From the series Tsurezuregusa (Essays in Idleness) commissioned by the Manji poetry circle. 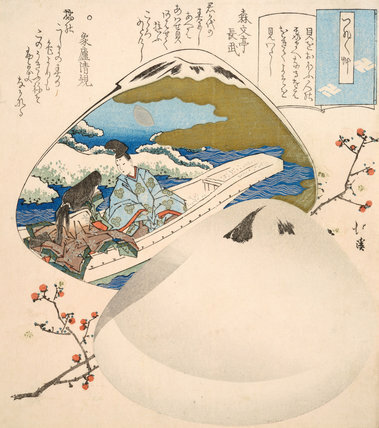 The scene in the shell is from the Heian-period novel, The Tale of Genji.